The initial catalyst for this project was a desire for a Sukkah for the harvest celebration in the Jewish faith. 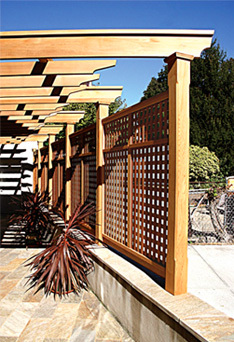 The Sukkah pergola became a lovely permanent addition to the back of the house providing shade for the small, but attractive patio in the summer months. 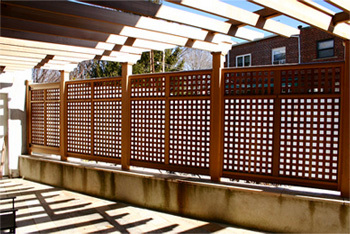 We created a privacy wall using a combination of lattice and translucent acrylic sheets placed upon a brick wall. This in turn supported the overhead structure which incorporated uniquely suspended rafters from the main beams.